In September, we announced that the Montreal Beach Resort will stay open through the holidays. That’s good news because there are so many fun things to do in Cape May this fall and winter. Though the area is best-known for its summertime scene, Cape May has just as many fun things to do in the fall and winter as it does in the summer. If crowds aren’t really you’re thing, the coolers months are an especially great time to visit. Plus, Halloween is comping up and we’re offering specials and packages all fall long that coincide with some of the area’s most exciting seasonal events. Here’s a special you can take advantage of right now. Enter your desired date range from the choices below. Follow the online booking instructions to book this special! * September 23 to through the closing of our 2018 season. 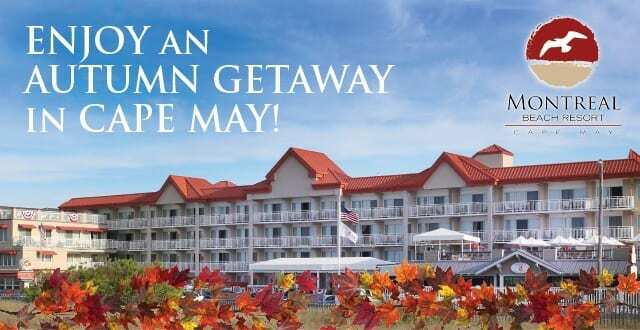 Cape May is one of the most haunted places in America and if you get a thrill from all things spooky, the Montreal Beach Resort in Cape May is the place for you! From the 1879 Emlen Physick Estate to a bevy of B&B inns, hotels and guest houses, all with resident spirits, you’ll find plenty to get your heart pumping. Cape May’s annual Halloween Parade is on Sunday, October 21. Before the parade starts, trick or treating will be held on the Washing Street Mall from Noon to 2 p.m. The Parade route begins at Perry Street and Carpenter Lane, goes down Carpenter Lane to Ocean Street, travels down Washington Street and ends at the Emlen Physick Estate located at 1048 Washington Street. Best of all, parade registration is free! Registration begins at 1:30 pm and is located on the corner of Perry Street and the Washington Street Mall. Divisions are: 3 and under, 4-6, 7-9, 10-12, 13-17, 18 and older, Groups and Floats. Prizes are awarded to all divisions at the conclusion of the parade at the Emlen Physick Estate. Parade sponsors are the City of Cape May, the Chamber of Commerce of Greater Cape May and the Mid Atlantic Center for the Arts and Humanities (Cape May MAC). For more information call the City of Cape May Department of Tourism, Recreation and Civic Affairs at (609) 884-9565. For a full list of fun things to do in Cape May, visit Cape May Magazine. Or, visit our Packages page to see what specials we’re running through the end of the year. Then, call our family-friendly beachfront resort for the best rates and room. We look forward to seeing you soon!